Play slot online is a loose adaptation of Peter Pan’s trusty fairy, Tinker Bell. This 5 reel is an enchanting pirate adventure featuring all the symbols of a pirate’s vessel; steering wheels, nautical maps and the perfect opportunity to win some magical free spins and multipliers, generating you only the best cash prizes offered by Eyecon. This game will keep you fluttering with excitement as the money keeps rolling in! Eyecon Games, founded in 1997, never disappoints with their online slots games. Based in Australia, Eyecon aims to create engaging, unique experiences for players to enjoy their games. Take, for example, some of their best-known slots: Fluffy Favourites, as well as Irish Luck, still demonstrate that this developer can cater for every audience around the globe. With over 6 billion spins over their 160 games every year, it’s clear that Eyecon wants to remain pioneers in their field, even after twenty years in the industry. Learn more about Eyecon games by visiting their website. Twinkle provides the player with a magical, Peter Panesque adventure. With pirates, treasure maps, cutlasses, anchors and barrels, we see the eponymous fairy sprinkle just a little fairy dust over us to bless us with luck! With a simplistic, magical theme, Twinkle has the player helping the fairy rescue her friends from an evil pirate ship. With gorgeous background art of the open sea at night, it is easy to relax and simply spin in this online slot game. With twenty-five pay lines across a 4 x 5 board, you have more than enough opportunity to try your luck in this slot game. 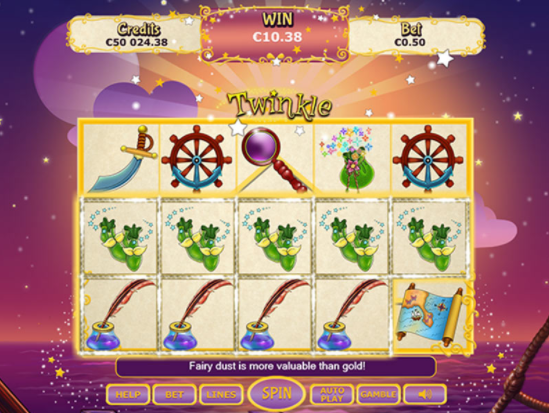 Twinkle provides the player with plenty of opportunities to increase their winnings, through a number of special symbols. In fact, Twinkle herself acts as the Wild in this slot; being able to be substituted for every symbol (except for the other specials) to create potential jackpot combinations. When she does appear, there is the added bonus of her doubling every win she is involved in. I guess the fairy luck is there after all! That is not all that Twinkle does. This character also functions as the Free Spins symbol. This means that if you get three, four, or five of these symbols on the board at once, you are awarded fifteen, twenty, or even twenty-five free spins! This feels incredibly generous, as well as rewarding – especially when you see your winnings go up. If the Green Jar symbol is found (that is this game’s Scatter) you are transported to the Prize Pick mode. In this mode, you spin once more – the more green jars you get, the higher your multiplier… up to 100x! Of course, if you are in the mood to try your luck, after every winning roll you have the choice to activate the Gamble option. If you guess the colour or the suit of the next card that appears in front of you, you can double your winnings! Be warned, however – you are only allowed to do this five times, so use them wisely. With a maximum bet of £50, if you are a high roller you will not be as punished for a loss as with other games. So that is a bit of a bonus as well! Learn how to deposit by mobile casino. Twinkle has a cute, friendly aesthetic, which definitely appeals to specific demographics that online slot games don’t normally do. The regular-slot bonuses work perfectly in this theme, and you are bound to have a good time in this magical world. 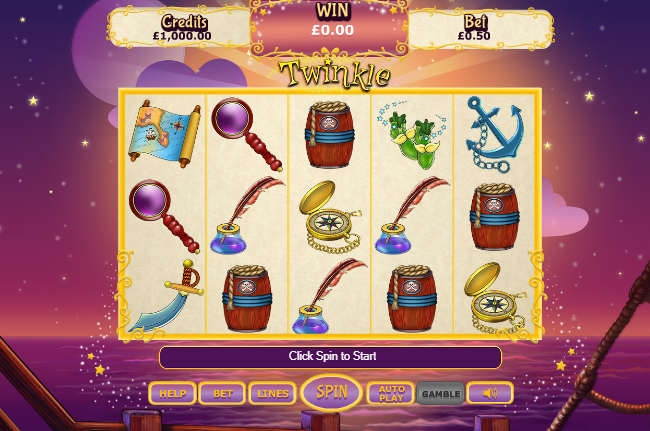 If you're a fan of Twinkle, then click here to play another popular online slot.